Can spirit really come over matter? Discover how some of your greater paradigms are broken, and reshape the way you view reality. 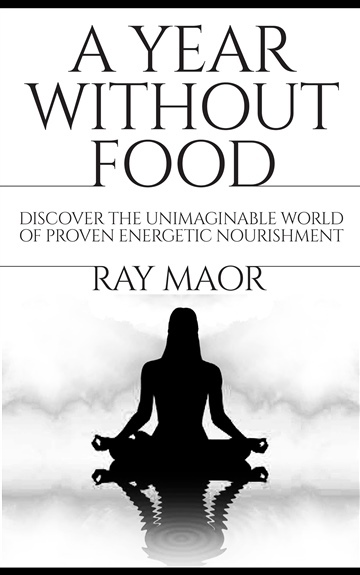 Can human life be sustained without food or on imaginable small quantities? The both scientifically researched and spiritual explained answer is in this book, but you will have to put aside many of today's current paradigms once you realize and feel the compelling evidence. After years of spiritual development, in search of a higher understanding of our path, Ray Maor decided to take the ultimate consciousness leap. Trusting in just the air to catch him, he undertook the dangerous but transformative Breatharian initiation. The air carried him far. As his soul and his body settled into this astounding way of living off the energy of Prana, he decided to go further again. In a world first television broadcast, he agreed to go for eight days without not just food, but water as well - while his every movement was filmed. The Israeli film crew set up comprehensively ”big brothered’ living quarters with no privacy - at all, at any time! A senior medical specialist was brought in to review Ray every day. As well as mental state evaluation and a physical examination, bloods were taken daily. The doctor only agreed on the basis that he could make the final decision to abort the experiment if Ray was in danger. In line with current medical teaching, the doctor was confident that Ray would not survive more than a handful of days before dehydration caused his organs to begin to shut down. This book is not just Ray’s personal account of this remarkable experiment. From his uniquely Breatharian perspective, Ray shares his greater journey in order to promote our understanding of our spiritual-mental connection to our physical body. If you are looking to float to new heights in your spiritual journey this book is for you. Ray’s insights will change the way you think about the world you live in. He dismantles the very foundations of how we think it all works ... ??? This book is a must! 'It is not my wish for people to stop being nourished from food, it is my goal to open up their consciousness to the fact that they are already being nourished energetically in a perfect manner and have them relearn and relive their eating and drinking experience a new, higher awareness point of view of excitement and self-love.' For those who seek a great understanding or those who are on self-development path, this book is a must. Ray Maor was born in Israel. Following a normal Israeli life, he joined the military service when he was 18 for a five-year service followed by a long trip abroad that opened up his eyes to the world of spiritual development.At the age of thirty-one Ray has decided to take a huge leap of faith by going through a 21 day fast \ pranic initiation that changed his life forever.Now Ray is a spiritual Breatharian guide that is committed to bringing the self-empowering and spiritual development knowledge to all that is in search for a higher understanding of our reality and our divine selves.